The summer schedule starts June 19th. A copy can be found on this website www.amkorkaratec.com or picked up inside the gym. The schedule stays the same with morning classes being added on Tuesdays and Thursdays and all evening classes being opened up to all ranks! This is done to better accommodate the busy schedules in the summer. Note: If your child is getting ready for the black belt pretest in September please take full advantage of the extra days for training. Morning classes and Saturday classes can wear an AmKor tee shirt with their belt and pants. All EVENING CLASSES must wear full traditional uniforms. The Trappe Fire Marshall would prefer that all parents park in the parking lot to drop off and pick up their children. If you pull up to drop of or pick up your child, you will be doing this at the risk of a ticket. I would highly recommend not parking in front of the stores and especially do not leave your vehicle. Master Matys is pleased to announce Kira Byers' on the spot promotion to black belt! Kira is the first female from the Collegeville Dojan to receive a promotion on the spot. Great job Kira!!! 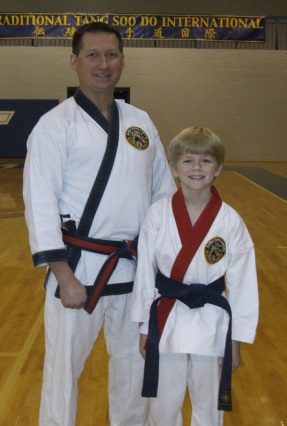 Master Matys is pleased to announce Ben Yorck's on the spot promotion to black belt! Master Matys is pleased to announce Sam Roberts on the spot promotion to black belt!! Sam is the first student in the history of the Collegeville Dojan to receive a promotion on the spot. Congratulations Sam!